Contains Green Tea Powder and Sweet Almond Oil, a natural moisturizer that is thought to be soothing. All Natural. Prunus Amygdalus Dulcis (Sweet Almond) Oil (and) Camellia Sinensis Leaf Powder(and) Hydrogenated Vegetable Oil.
" 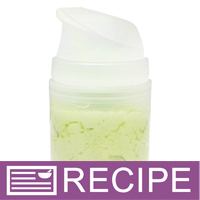 Green Tea Butter Blend"
COMMENTS: Love this green tea butter blend, to my cold process soap. This butter added a very smooth and nice texture to my soaps and was very good in the total outcome process. COMMENTS: I add this to my lip products and it gives them a nice boost! I've tried several different butters, and this one definitely made my favorite results. Nice smooth consistency, no added odor or color in final product. COMMENTS: I used this in my lotions and my whipped body butters and my customers are going crazy over it!! "Green Tea Butter Blend "
COMMENTS: A nice blend butter. COMMENTS: I tried the wsp green tea facial cream recipe and it works great, now I'm making my own after sun care lotion and will be using the green tea butter. Lend for that as well. "This butter blend is great!" COMMENTS: I added about 1oz of this to my Green Tea CP soap for color and to try it out. I ended up using a mica powder to color the soap anyway, but this oil did great in the soap, and behaved well. I could not find green tea butter on any list of oils/butters in any lye calculator so I used this butter as part of my super fat percentage. All in all, this butter smells nice and looks great on a label. COMMENTS: Very luxurious and moisturizing! COMMENTS: Green tea is good for many things including mixing!!! Blends well, I love it! "Makes a nice body lotion." COMMENTS: I had found so many recipes for high lighting green tea that I decided to buy this paste instead of a powder. I am glad I did. It blended in easily for my body lotion, and I didn't have to prepare it in any way. I would highly recommend this paste and am sure I will be reordering when I am out. "Beautiful green tea sugar scrub"
COMMENTS: I saw a recipe for a green tea sugar scrub on pinterest. I wanted to make it for my customers because this green tea butter actually has green tea powder in it. I love that it's good at protecting our skin from sun damage and wrinkles, aids in cellulite etc, the list goes on. This is a wonderful product, and smells amazing. Can't recommend this enough! COMMENTS: A wonderful butter. I use it in my green tea and cucumber HP soap as superfat. Adds a nice texture to the soap and benefical green tea properties. "Fillies with so many antioxidants "
COMMENTS: A wonderful scoop goes a long way into my butters! Love it! COMMENTS: Like the butter and smells like just like green tea powder. COMMENTS: Absolutely amazing. Couldn't wait to order more. COMMENTS: It is nice but expensive, this is a heavier butter and can be greasy depending on your recipe. COMMENTS: I love working with this green tea extract. It is wonderful in my eye creams. A little goes a long way. COMMENTS: Love the effects of this product but it leaves a greasy residue on your skin. COMMENTS: Work beautifully in my lotion bars that are for sun protection. I like that it has anti-inflammatory properties and will help protect skin from the sun. Great product melts easy I am happy with it. COMMENTS: We use this for several things but mostly for a butter for the hands and face. The people who want this use it for itchy dry skin. It is amazing. It has a fresh clean scent on its own and we whip it with a few other ingredients to alleviate itchiness. COMMENTS: I am new to create my own lotion, but I followed the instructions to create it and I am so pleased with the results, it leaves my skin silky and improved my always dry hands, I even use it on my face! I will buy more and am excited to jump into new projects. I love the description of each product and the recipes are an excellent guidance. "Perfect Addition for Extra Moisturizing Boost"
COMMENTS: When I first opened the jar, I expected a green tea smell (which would have been alright with me, but not if a customer wanted a different fragrance) but there isn't much of a scent at all. The consistency of the butter is so smooth and thick that only a little bit is needed and it sure does the job for moisturizing problem areas on the skin (elbows, knees, knuckles etc). I'm very pleased with this product and will be incorporating it into more formulas for sure. COMMENTS: Great to make mask and face creams. COMMENTS: I whip this with essential oils for an amazing body butter. I think the butter blends are a little overpriced though. "Everyone loves my lip balm"
COMMENTS: This is my favorite lip balm ingredient. I have requests for it all the time. I like the texture for lip balm because it's softer. It also works nicely in lotion and body butter. COMMENTS: I was liking the idea of making myself a body butter for the summer months.Being an outdoorsey girl of almost 40,it's now showing.Green tea has so many good things to help skin like mine that its disapointing it is not in a better base than vegetable oil.Did not sit nicely on my skin. COMMENTS: I used this in the Green Tea Lotion recipe that Whole sales supplies has. It made such a great lotion and has a wonderful consistency! COMMENTS: Awesome in my facial products! !!! COMMENTS: This butter is very smooth and creamy. It has a very natural, "clean" smell. I could use it alone - it's that good! I mix it into my lotions and CP soap. When mixed in small amounts with other butters and oils, it will have a slight green tint. It's not an "ew" green tint, but more of an earthy tone. I love it! COMMENTS: I used this in a lotion and it turned out amazing! COMMENTS: i purchased this butter by mistake, i ended up using the recipe from wsp recipes list and made the green tea lotion. i just love the feel of the lotion on the skin, not greasy. makes my skin feel nice. this is a must have for me i will purchse more , i also made a cold process soap with this . "Already a must have for me"
COMMENTS: I have already made the pre-sun lotion bars using this. These turned out great and people are stocking up for their beach trips. I also am using this in a body butter recipe. I love the feel of this butter blend....soft and creamy with no residue. It definitely has a green tint and a little odor but so far has worked well with the FO's I've used. I can't wait to use this in more recipes....excellent feel on the skin. COMMENTS: I love adding butters and oils that give benefit to my lotions and soaps. This one is just a great additive for my sun screen lotion. You only need a small amount too, which is good. COMMENTS: I added this to my green tea cp soap. Very easy to use. I feel this add a little more green tea benefit to my soap. Definitely a product I will continue using. COMMENTS: Makes a lovely butter, I started with the recipe on this site and tweaked it a bit and, with the Cucumber Green Tea scent it has become a permanent fixture to my product line! COMMENTS: It is an awesome butter all by itself. I love the inflammatory properties as well as in the recipe for the green tea butter blend. I love the color and feel. It is definitely one of my personal favorites. It is so soothing to the skin. COMMENTS: I have so far made body sprays and lotion with it. I made a Green Tea Blend, and it turned out great. I love it. It is very moisturizing and not greasy, and I love the green sheen it gives. It is a lot more than the butters we normally use, but I think it will sell really good and make it worth it, and then we can buy in bigger sizes. A real winner. "Great butter for lotion bars!" COMMENTS: I have just started making my own lotion bars and added this as one of my base ingredients. My bars came out great! Will surely be using it again for other batches! COMMENTS: im not a huge fan of the color of this butter, but i have noticed a difference where i use the lotion bar i made with this butter. my legs seem smoother since ive been using it. "ONE OF MY FAVORITE BUTTERS"
COMMENTS: ONE OF MY FAVORITE BUTTERS TO ADD TO MY LOTION BARS! COMMENTS: This is a great item to add moisture without greasiness to lotions!! I use this straight out of the container on days my hands are super dry from washing lots!! Green in color but so far does not seem to stain clothing or sheets!! "Green Tea Body Butter is AWESOME!!!" COMMENTS: As an Esthetician with my own Bath & Body Co. its important to me that I use quality products and ingredients. I LOVE WSP products! Quality is always above my expectation. I TRUST the products and the INTEGRITY of the company. I love all the butters!!! But the Green Tea is especially a favorite choice of mine. My clients LOVE this blend. COMMENTS: This make a fabulous body butter, mixed with Shea and some nice oils. My customers love this- and the color is stunning. COMMENTS: I was looking for the right butter blend to add to my body butters to really soothe and protect the skin from aging. I tried many of the butter blends, but have settled on the green tea as my base. I love the feel and color as well as all the benefits of green tea. It is very reasonably priced and I use the jars for storing other butter portions afterwards. It does have a slight scent, but blends in well with all the fragrance oils I've used. I also use it in my soothing foot creme and white and green tea face cream. COMMENTS: I mixed this with a hair butter! Love the smell and consistency! COMMENTS: I used this green tea butter blend in my homemade sunscreen and I loved it. It does give off a slightly green tint, but I didn't mind that. This butter is so creamy and wonderful for your skin! It does not have an unpleasant smell either which is great. "Great for Soaps and Everyday Usage!!!" COMMENTS: This is an excellent butter to use in soaps but this may be another one that I keep for everyday usage. I love how it goes on light and has no scent to it. It is non-greasy. I love it!! COMMENTS: After sampling many great butters from WSP I must say this is my favorite. It feels so good on your skin and absorbs very well. I made lotion with this and paired it with WSP Bamboo FO. It smells wonderful and is my favorite lotion thanks to this butter. It does tint your final product a little but I don't mind having a slightly green base since I add a little color anyway. "Very pleased with results so far"
COMMENTS: I added some WSP pumice Powder to this product and used with my MicroDerm abrasion brush/pad (when I ran out of original product). Worked very well as a base cream and the pumice powder was very mild. I was really impressed with the results. I'll experiment more with this product. COMMENTS: Love it, we use it in our Green Tea Lip Calm! Leaves the lips beautiful! COMMENTS: I use this product to make my Relief Cream! Excellent seller for me!!! Thank you for top quality products!! COMMENTS: I love this green tea butter!!! I use it in my lotions, won't make it without it...don't ever stop selling this! It is so creamy and wonderful! COMMENTS: Mild tea scent. Easily penetrates into skin. Spreads easily. Can be used as is. Dries to powdery finish. "I will order this again!!!" COMMENTS: I just received my first jar of this butter, and I can tell already I am going to love it. I rubbed a bit into the skin on the back of my hand, and there was nothing but smooth softness. No greasiness, no oil slick. I will be adding this to quite a few of my products! COMMENTS: This is a great product. It has a smooth and light consistency and rubs in nicely with no oily residue. It is one of our best sellers! COMMENTS: I made a really nice body butter with this. Please keep this around. I like it a lot. Very rich and creamy. COMMENTS: The natural light fragrant green tea essence makes this perfect for anyone looking for a natural product. I blended it with a premium lotion and created a lovely body creme. Thank you! COMMENTS: I used this in to make a great whipped body butter and added green tea f.o. I didn't have to add color as it was already green. "everytime i use green tea powder in the product its beautiful green at first few days later it turns brown .. just like real tea. how is this product staying pretty green.?? also what does this smell like? is there scent? " Staff Answer It might be the way this butter is processed but it does keep its nice green color. "hi, can i use this in my hair or is it only for the skin??" Staff Answer If you would like to use this in your hair, you can certainly do that. "Green Tea Butter Blend Can this be whipped to create a whipped body butter? Or is this not the correct blend to be whipped?" Staff Answer Any of the butter blends can be whipped. "What is the HLB of this butter? I'm trying to make a lotion with it but it's not available on the HLB calculator." Staff Answer The HLB for this butter is 11. "Does this butter contain caffeine, if so how much?" Staff Answer This product naturally contains caffeine due to the green tea in it. The amount of caffeine is not standardized so we are unable to give an amount. Staff Answer We recommend checking out the ingredients listed on our website. This is an all-natural product consisting of sweet almond oil, green tea extract and vegetable oil. "Hi can one use this as is for a nice body butter?" Staff Answer Absolutely!! We use the butter blends in many lotion recipes, etc. but they are all wonderful to use just by themselves. "Does anyone recommend any fragrance they added to this butter?" Staff Answer Here is a recipe we made and used Green Tea & Cucumber Fragrance Oil which smelled wonderful! http://www.wholesalesuppliesplus.com/education/recipes/green-tea-butter-lotion.aspx. "I would like to use this in a cold process. Any recipes to share??" Staff Answer At this time, we do not have any CP soap recipes using the green tea butter blend. "I have noticed that most of WSP Butter Blends are not included on your lye calculator. Please why is that? Does it mean that you do not encourage buyers to use these butter blends in soap making? So they should only be used in body butters, creams and lotions?" You can substitute this blend for an oil in the calculator that has identical properties to make your formulation.
" Can this green tea butter blend be used in place of shea butter in a face cream recipe?" Staff Answer Yes, you can substitute our Green Tea Butter for Shea Butter in a lotion formula. I would recommend that you test this substitution in a small batch as it may not be appropriate for all skin types. "If I am formulating a lotion using Green Tea Butter Blend as a base, and adding only Tapioca Starch, Vitamin E T-50 and Aloe Vera Oil to the formulation, is a preservative necessary? Thanks." Staff Answer No. A preservative is only necessary if you are adding water to your formula. "does this actually smell like green tea?" Staff Answer The Green Tea Butter Blend does not have an odor. "Can you use this as-is 100% on your face and body?" Staff Answer Yes you can. However, as this is a straight butter it may be to heavy or greasy for some skin types. I would recommend testing to be sure that you are satisfied with the results. You can, but it will be too heavy for several skin types. It will also be slow to melt. Consider melting and whipping with another oil. You can, but it has a slightly smokey, nutty smell that may be off putting to others. Shea butter does not absorb into the skin well. Instead it sits on top. It's a wonderful moisturizer, but because it is so heavy, consider using only a bit in a carrier oil or using it as part of an emulsified butter or lotion recipe. Yes Cocoa butter is amazing for the skin. It might be hard it is pretty hard. They are hard oils and hard to do anything with unless melted I find once melted once they are slightly easier to use as is.